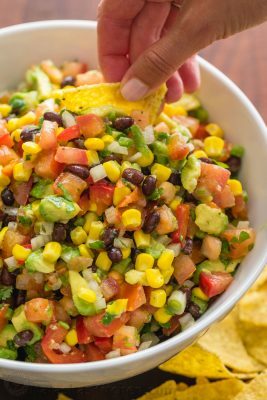 This Cowboy Caviar salsa is wonderfully fresh, healthy, simple and loaded! We make this salsa all summer long. It makes a big batch so it is an ideal summer party dip. A surprising ingredient infuses every bite with incredible flavor. In a large mixing bowl, combine diced tomatoes, chopped onion and bell pepper, seeded and diced jalapeño, sliced avocado, drained corn, rinsed and drained black beans and chopped cilantro. Stir in 3-4 Tbsp of lime juice, 1/2 cup of Italian dressing, 4 pressed garlic cloves and 1 tsp of salt or season to taste. Mix everything together and serve with tortilla chips. We use either Newmans Own or Olive Garden brand light Italian dressing.